Being on a layoff budget means eating lots of chicken and other lower-cost meats (eww, that sounds terrible). But that also means trying to be creative with the same package of chicken legs week in and week out. One of the cooking blogs I love following is Smitten Kitchen because of all the beautiful food photography, but I rarely make any of the recipes because they're too "gourmet" in terms of complexity (for me to make) or fancy tasting (for K to enjoy). ^_^;; However, her buttermilk roast chicken recipe is a home run for both of us! 1) Whisk buttermilk with garlic, table salt, sugar, paprika and lots of black pepper in a bowl. 2) Place chicken parts in a gallon-sized freezer bag (or lidded container) and pour buttermilk brine over them, then swish it around so that all parts are covered. Refrigerate for at least 2 but preferably 24 and up to 48 hours. 3) When ready to roast, preheat oven to 425 degrees. Line a 9"x13" baking dish with foil. 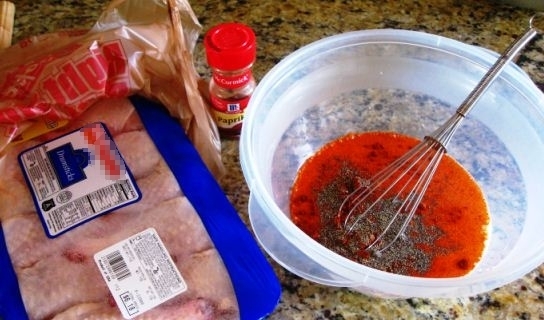 Remove chicken from buttermilk brine and arrange in dish. 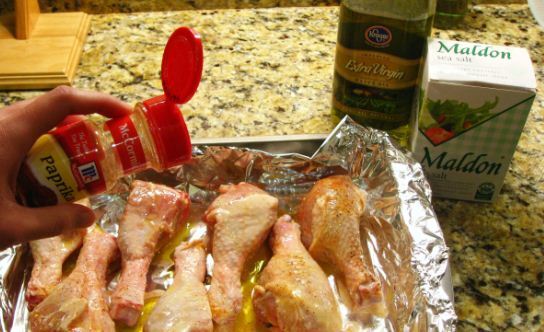 4) Drizzle lightly with olive oil, then sprinkle with additional paprika and sea salt to taste. 5) Roast for 30 minutes for legs (approximately 35 to 40 for breasts), until brown and a bit scorched in spots. Serve immediately. Something about that buttermilk brine just makes the roasted chicken skin oh-so-savory. 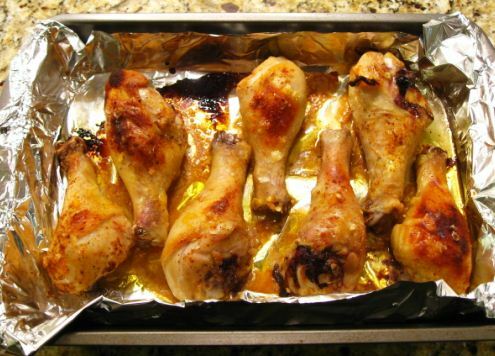 Overall, we love this delicious spin on an otherwise ordinary chicken legs recipe.